An unusual and delicious way to enjoy this fall veggie. Tip: Add shrimp or strips of chicken breast to make it heartier main dish. Heat oil in a large nonstick skillet. Add turnips, cover and cook over medium-high heat, stirring often, 7 to 9 minutes, or until turnips are golden and almost tender. Stir in garlic and ginger; stir-fry 1 minute. Add greens and sprinkle with 3 Tbsp water. 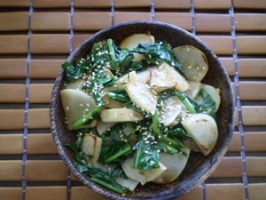 Cover,and cook, stirring occasionally, 4 to 5 minutes or until turnips and greens are tender. Drizzle with soy sauce and sprinkle with sesame seeds; toss. Transfer to a serving bowl.